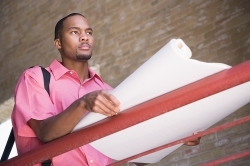 Go-Jamaica JobSmart :: Are architects worth the hire? Are architects worth the hire? Local architects point out that their fees are easily negotiated. Fees are also guided by a recommended scale from the Jamaica Institute of Architects, notes Christopher Whayms-Stone president of Jamaica Institute of Architects and partner in the firm Corner Stone Design Limited. In general, it is recommended that architects are paid seven per cent of the estimated construction cost. This percentage may go up for smaller units and go down for larger construction projects. On a building costing $5 million to build, the recommended scale of fee is 7 per cent of the construction cost. For homes in Cherry Gardens and Norbrook where $50 million is often spent on construction, design costs alone, he says, is $1.5 million. In general, rates are not fixed and negotiated between architect and client. According to Christopher Whayms-Stone, what the architect provides on completion of his work is a quality product with good aesthetics, "proportionally, volume-metrically and functionally." The architect's work affects ventilation and good quality lighting. Rooms should not be too small or so large that they are a waste of space. The schematic design is produced after the architect meets with client and discusses the scope of work. The architect then puts pen to paper and takes the clients idea and professional input and creates a product. In the development phase, if the client is pleased after the schematic phase, the architect proceeds to detail the project and investigate use of materials, the quality of the site and the finishes required. In the documentation phase, drawings are prepared which will be used of Parish Council approval and give to contractors for construction. These documents can be used any where in world Christopher Whayms-Stone notes. In the tender stage the architect prepares a package based on architectural drawing and engineering drawings. With the services of quantity survey, a bill of quantities is prepared. The architect then costs everything. The project will then be submitted to three or four building contractors who will suggest rates and prices based on what they know they can provide. At the end of process architect and quantity surveyor chooses the best offer. In the construction administration phase, a contract is signed to construct the building and the architect then proceeds to make sure that the building is being built to the specifications of the drawing. Each month wit the assistance of the quantity surveyor he or she will ensure how much work has been done and determine what is to be paid to the contractor each month. Christopher Whayms-Stone notes that "some clients only want you to do a schematic design to take this and raise funds. Some want the service all the way up to construction. Still others provide their own contractor and may hire their own project manager to administer the contract. Based upon what aspect of the architects services they want, a price can be negotiated. In general, professional fees come to ten per cent of construction costs - architects, engineers, quantity and land surveyor. Whayms-Stone notes that the architect brings to the table efficiency, especially in the use of funds. Having spent $10 million, he or she can give you a house which his worth almost two times that in terms of resale value. The architect avoids overspending and balances the design to fit the budget. *Avia.Collinder@gleanerjm.com. Email Christopher Whyms-Stone at stonec@kasnet.com.